Few would argue that the sneaker is the current champion of footwear fashion. 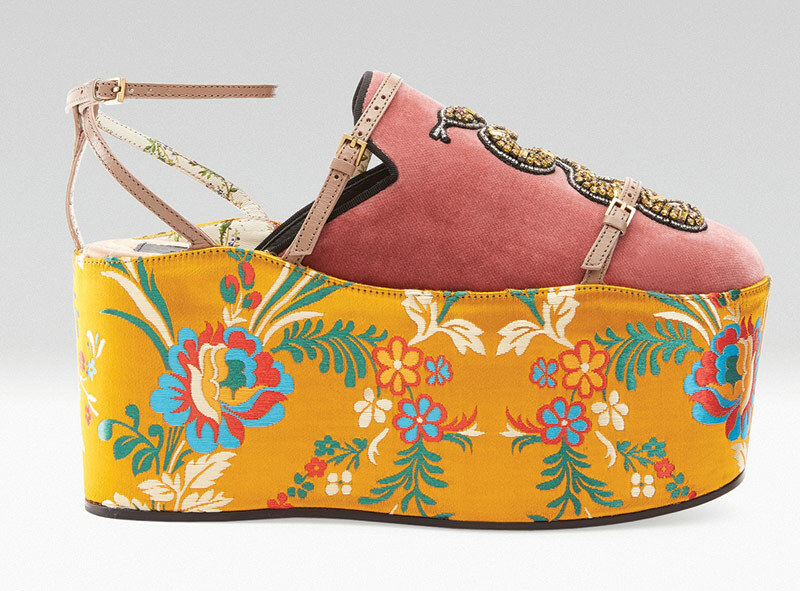 Luxury design houses have been forced to introduce their own takes on the sporty silhouette, coming off the heels of the Birkenstock renaissance, which forced them to reimagine frumpy sandals. It seems the stiletto has become taboo in the age of athleisure, where the houses of Nike and Adidas hold more sway than Prada, Dior, Versace, Ralph Lauren…But then there’s Gucci, which stands as a beacon of luxury in a world gone athletic. When creative director Alessandro Michele took the helm in 2015, he presented a worldview that was colorful, opulent and even a little kitschy. The now-famous fur-lined Princetown slides became all the rage in 2015, triggering a host of imitators to let their collective hair down, so to speak, and go wild on fur accents. Then there’s the label’s horse-bit loafers, silk flatforms, embroidered slides, block-heel loafers and cross-strap mules that have also been redesigned, reinterpreted and simply knocked off by legions of competing designers and mass-market brands. And it’s not just women’s—Gucci’s embroidered sneakers and kangaroo-fur loafers ($995 retail) are lighting up men’s fashion as well. For the past four seasons, the house that Michele built has had the golden touch for footwear trends. Neenu Jacob, cofounder of Hook, a fashion discovery app that aggregates multiple shopping websites onto one platform, reports that search queries for Gucci’s men’s shoes are outpacing women’s. 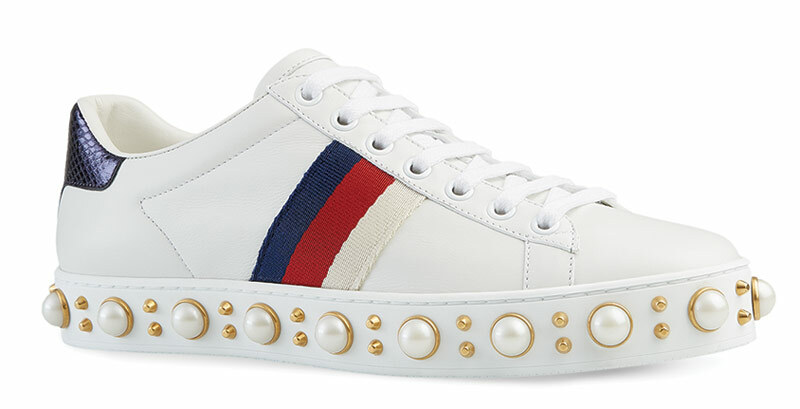 Additionally, Jacob says Gucci flats were the most-searched footwear in April on Hook, and the label’s Ace lo-tops are second to Adidas as the most-searched sneakers so far this year. Hook’s data reveals that Gucci footwear holds the number-three Visibility Rank, which means on average a Gucci shoe is the third product listed on online marketplaces in the U.S. “Additionally, at least two out of the top 10 shoes bear the Gucci logo,” Jacob says. In addition to comfort, Mahoney cites several other reasons for Gucci’s breakout success. He points to craftsmanship and quality of materials, first and foremost, along with Gucci’s constant “changing of the guards” and influx of fresh talent. He’s also notes the label’s popularity in Asia, a growing luxury market. Last, he says, is the worldwide admiration from editors, stylists, high-profile clients and celebrities. “[Influencers] wear the brand’s pieces on red carpets, at galas and at awards shows, and shoppers run to acquire the latest accessories they’ve seen,” Mahoney says. In addition, recent fashion weeks have seen countless street-style stars sporting Gucci’s fur-lined Princetown slides, pearl-encrusted mid-heel loafers, Marmont patent pumps and metallic kiltie mid-heel mules. (Not to mention, the must-have faded Gucci T-shirt and classic double-G gold belt.) Jacob confirms that the brand’s Marmont pumps (a block-heel kiltie loafer) in red, pink and gold and floral slides are top sellers. For those who can’t afford the real thing, she cites Ash, Erdem, Mango, Topshop and Sam Edelman as having popular renditions. Going forward, Jacob predicts embellished and “blingy” updates to the Marmont style will gain traction, along with jacquard slippers for men and women. “The new jacquard collection with Donald Duck and tigers, metallic leather pumps and the embellished ‘Bow’ pumps are our best bets to restock in spring,” she says, adding, “Asian souvenir-shop influences continue to shape Gucci for the coming seasons, but with a lighthearted, art-meets-pop-culture vibe in 2017.” She points to Rihanna’s bedazzled Gucci outfit for Coachella as the first sign that all-out bling is ready for liftoff. Mahoney believes that mules and fur will also continue to have legs this year, along with embroidered sneakers and printed canvas.